The hormone produced by the thyroid, thyroxine controls the body's metabolism, the rate at which it burns calories for energy. It also controls the body's utilization of fat but a decline in the secretion of hormones from the thyroid gland, known as hypothyroidism can result in far wider symptoms such as poor concentration, confusion, memory problems, cold hands and feet and weight gain (the full list of 47 hypothyroidism symptoms identified by Dr Broda Barnes are available in Dr Ward Deans article ‘Hypothyroidism - The Underdiagnosed Epidemic’ here). Some hypothyroidism, clinically diagnosed as thyroid deficiency syndrome, may be caused by a condition called Hashimoto's thyroiditis. Hashimoto's thyroiditis is an autoimmune disease in which the body's own immune defenses turn on the thyroid gland, causing an inflammatory process that eventually destroy it, 90% of the sufferers of Hashimoto's thyroiditis are women. According to the makers- RLC Labs, their brands of natural porcine thyroids- Westhroid® and Nature-throid® are hormonally IDENTICAL – they both contain the same thyroid composition and excipients, the only difference is the binding ingredient. However, the brand Westhroid® appears to be no longer in the maker’s catalog, instead it seems to have been transformed into WP-Thyroid® which contains the additions of inulin, (from chicory root) and medium chain triglycerides (from coconut). This regime is of course dependent upon body temperature, blood tests and the health of the patient. It may be that your final natural thyroid dose will be slightly lower or higher than 60mg - but that is the typical average dose for a patient. Marios Kyriazis M.D. wrote a piece about why differing / uneven supplementation (for all supplements - not just thyroid) may be beneficial and gave a strong scientific argument with references in the Journal of Antiaging Medicine which is now called Rejuvenation Research although there isn't a definitive clinical proof for it. *Reprints can be ordered here. Please note that abstracts are not available free of charge. “In the 1940s, Dr. Barnes realized that the blood tests were usually inaccurate. Consequently, he developed a simple test to confirm suspected low thyroid function using an ordinary thermometer. He found that normal underarm or oral temperatures immediately upon awakening in the morning (while still in bed) are in the range of 97.8 to 98.2 degrees Fahrenheit. He believed that a temperature below 97.8 indicated hypothyroidism; and one above 98.2, hyperthyroidism (overactive thyroid). Dr. Barnes recommended that the underarm temperature taken immediately upon awakening be used to diagnose hypothyroidism. Unfortunately, even today's highly sophisticated tests are no more accurate than the tests used in Dr. Barnes’ era. Therefore, I instruct my patients to take their temperature orally (as opposed to underarm) immediately upon awakening in the morning as a guide to diagnosis and treatment of hypothyroidism. At the same time I have my patients check their resting pulse rate which should be between 65 and 75. Can I ask you one more question? It is in relation to taking vitamins, minerals and other supplements. The synthetic thyroid I am currently taking says I should not take vitamins etc., within 4 hours of taking thyroid - does this advice also apply to Armour® thyroid? We see no harm in taking both Armour® and vitamins together at more or less the same time. I do! One tip is that chewing the Armour tablet carefully helps to get some it of sublingually, therefore faster into the bloodstream - in my opinion there is virtually no flavor to them so it is not unpleasant. One grain (equivalent to 60mg) or higher dosages are potent and usually require temperature monitoring and occasional blood tests. Persons with more-serious thyroid conditions are often be prescribed one grain. Dosages under a physician's guidance can often reach three to five grains daily. Dosages of more than one grain are usually increased by a grain over one to two weeks. Quarter grain and half grain whole thyroid supplements (15mg to 30mg)) provide less potency and are used to support an aging thyroid condition. However, long-term use of low dose whole thyroid extracts may also require occasional breaks and monitoring. One of the key factors of ageing is the depletion in size and activity of the thyroid gland. The thyroid controls our metabolism – how we use the energy that enters our body through food. The decline of the thyroid can trigger a number of health problems in later life, including the Thyroid disease hypothyroidism, characterised by a decline in hormone secretion (not to be confused with hyperthyroidism, which denotes an overactive thyroid). It is crucial then to protect and boost your thyroid with specially-tailored anti-aging thyroid supplements - helping to guard against thyroid symptoms and promote health and vitality. Many factors come into play with thyroid issues, including age, weight, and natural metabolic activity. Our unique range of thyroid armour supplements offers a comprehensive programme of treatment. It's the best way to guarantee you'll get the right thyroid dosage for your needs. 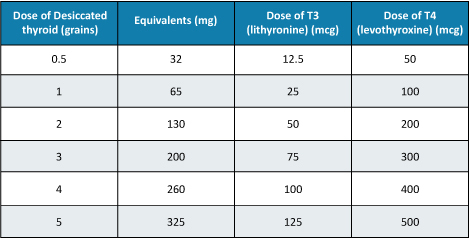 liothyronine (T3) per grain of thyroid. The inactive ingredients are calcium stearate, dextrose, microcrystalline cellulose, sodium starch glycolate and opadry white. As pituitary TSH suppressants, in the treatment or prevention of various types of euthyroid goiters, including thyroid nodules, subacute or chronic Iymphocytic thyroiditis (Hashimoto’s), multinodular goiter, and in the management of thyroid cancer. Thyroid hormone preparations are generally contraindicated in patients with diagnosed but as yet uncorrected adrenal cortical insufficiency, untreated thyrotoxicosis, and apparent hypersensitivity to any of their active or extraneous constituents. There is no well-documented evidence from the literature, however, of true allergic or idiosyncratic reactions to thyroid hormone. Thyroid hormones should be used with great caution in a number of circumstances where the integrity of the cardiovascular system, particularly the coronary arteries, is suspected. These include patients with angina pectoris or the elderly, in whom there is a greater likelihood of occult cardiac disease. In these patients therapy should be initiated with low doses, i.e., 15-30 mg Armour Thyroid. When, in such patients, a euthyroid state can only be reached at the expense of an aggravation of the cardiovascular disease, thyroid hormone dosage should be reduced. Thyroid hormone therapy in patients with concomitant diabetes mellitus or diabetes insipidus or adrenal cortical insufficiency aggravates the intensity of their symptoms. Appropriate adjustments of the various therapeutic measures directed at these concomitant endocrine diseases are required. The therapy of myxedema coma requires simultaneous administration of glucocorticoids. Hypothyroidism decreases and hyperthyroidism increases the sensitivity to oral anticoagulants. Prothrombin time should be closely monitored in thyroid-treated patients on oral anticoagulants and dosage of the latter agents adjusted on the basis of frequent prothrombin time determinations. In infants, excessive doses of thyroid hormone preparations may produce craniosynostosis. Replacement therapy is to be taken essentially for life, with the exception of cases of transient hypothyroidism, usually associated with thyroiditis, and in those patients receiving a therapeutic trial of the drug. They should immediately report during the course of therapy any signs or symptoms of thyroid hormone toxicity, e.g., chest pain, increased pulse rate, palpitations, excessive sweating, heat intolerance, nervousness, or any other unusual event. In case of concomitant diabetes mellitus, the daily dosage of antidiabetic medication may need readjustment as thyroid hormone replacement is achieved. If thyroid medication is stopped, a downward readjustment of the dosage of insulin or oral hypoglycemic agent may be necessary to avoid hypoglycemia. At all times, close monitoring of urinary glucose levels is mandatory in such patients. In case of concomitant oral anticoagulant therapy, the prothrombin time should be measured frequently to determine if the dosage of oral anticoagulants is to be readjusted. Partial loss of hair may be experienced by children in the first few months of thyroid therapy, but this is usually a transient phenomenon and later recovery is usually the rule. Oral Anticoagulants—Thyroid hormones appear to increase catabolism of vitamin K-dependent clotting factors. If oral anticoagulants are also being given, compensatory increases in clotting factor synthesis are impaired. Patients stabilized on oral anticoagulants who are found to require thyroid replacement therapy should be watched very closely when thyroid is started. If a patient is truly hypothyroid, it is likely that a reduction in anticoagulant dosage will be required. No special precautions appear to be necessary when oral anticoagulant therapy is begun in a patient already stabilized on maintenance thyroid replacement therapy. Insulin or Oral Hypoglycemics—Initiating thyroid replacement therapy may cause increases in insulin or oral hypoglycemic requirements. The effects seen are poorly understood and depend upon a variety of factors such as dose and type of thyroid preparations and endocrine status of the patient. Patients receiving insulin or oral hypoglycemics should be closely watched during initiation of thyroid replacement therapy. Cholestyramine or Colestipol—Cholestyramine or colestipol binds both levothyroxine (T4) and liothyronine (T3) in the intestine, thus impairing absorption of these thyroid hormones. In vitro studies indicate that the binding is not easily removed. Therefore four to five hours should elapse between administration of cholestyramine or colestipol and thyroid hormones. Estrogen, Oral Contraceptives—Estrogens tend to increase serum thyroxine-binding globulin (TBg). In a patient with a nonfunctioning thyroid gland who is receiving thyroid replacement therapy, free levothyroxine (T4) may be decreased when estrogens are started thus increasing thyroid requirements. However, if the patient’s thyroid gland has sufficient function, the decreased free levothyroxine (T4) will result in a compensatory increase in levothyroxine (T4) output by the thyroid. Therefore, patients without a functioning thyroid gland who are on thyroid replacement therapy may need to increase their thyroid dose if estrogens or estrogen-containing oral contraceptives are given. Nursing Mothers—Minimal amounts of thyroid hormones are excreted in human milk. Thyroid is not associated with serious adverse reactions and does not have a known tumorigenic potential. However, caution should be exercised when thyroid is administered to a nursing woman. Pediatric Use—Pregnant mothers provide little or no thyroid hormone to the fetus. The incidence of congenital hypothyroidism is relatively high (1:4,000) and the hypothyroid fetus would not derive any benefit from the small amounts of hormone crossing the placental barrier. Routine determinations of serum T4 and/or TSH is strongly advised in neonates in view of the deleterious effects of thyroid deficiency on growth and development. Treatment should be initiated immediately upon diagnosis, and maintained for life, unless transient hypothyroidism is suspected; in which case, therapy may be interrupted for 2 to 8 weeks after the age of 3 years to reassess the condition. Cessation of therapy is justified in patients who have maintained a normal TSH during those 2 to 8 weeks. Excessive doses of thyroid result in a hypermetabolic state resembling in every respect the condition of endogenous origin. The condition may be self-induced. Dosage should be reduced or therapy temporarily discontinued if signs and symptoms of overdosage appear. Treatment may be reinstituted at a lower dosage. In normal individuals, normal hypothalamic-pituitary-thyroid axis function is restored in 6 to 8 weeks after thyroid suppression. Treatment of acute massive thyroid hormone overdosage is aimed at reducing gastrointestinal absorption of the drugs and counteracting central and peripheral effects, mainly those of increased sympathetic activity. Vomiting may be induced initially if further gastrointestinal absorption can reasonably be prevented and barring contraindications such as coma, convulsions, or loss of the gagging reflex. Treatment is symptomatic and supportive. Oxygen may be administered and ventilation maintained. Cardiac glycosides may be indicated if congestive heart failure develops. Measures to control fever, hypoglycemia, or fluid loss should be instituted if needed. Antiadrenergic agents, particularly propranolol, have been used advantageously in the treatment of increased sympathetic activity. Propranolol may be administered intravenously at a dosage of 1 to 3 mg, over a 10-minute period or orally, 80 to 160mg/day, initially, especially when no contraindications exist for its use. Other adjunctive measures may include administration of cholestyramine to interfere with thyroxine absorption, and glucocorticoids to inhibit conversion of T4 to T3. The dosage of thyroid hormones must in every case be individualized according to patient response and laboratory findings. In acute, emergency conditions, injectable levothyroxine sodium (T4) may be given intravenously when oral administration is not feasible or desirable, as in the treatment of myxedema coma, or during total parenteral nutrition. Intramuscular administration is not advisable because of reported poor absorption. Therapy is usually instituted using low doses, with increments which depend on the cardiovascular status of the patient. The usual starting dose is 30 mg Armour Thyroid, with increments of 15 mg every 2 to 3 weeks. A lower starting dosage, 15 mg/day, is recommended in patients with long-standing myxedema, particularly if cardiovascular impairment is suspected, in which case extreme caution is recommended. The appearance of angina is an indication for a reduction in dosage. Most patients require 60 to 120 mg/day. Failure to respond to doses of 180 mg suggests lack of compliance or malabsorption. Maintenance dosages 60 to 120 mg/day usually result in normal serum T4 and T3 levels. Adequate therapy usually results in normal TSH and T4 levels after 2 to 3 weeks of therapy. Readjustment of thyroid hormone dosage should be made within the first four weeks of therapy, after proper clinical and laboratory evaluations, including serum levels of T4, bound and free, and TSH. route of administration of both hormones is intravenous. Levothyroxine sodium (T4) is given at a starting dose of 400 mcg (100 mcg/mL) given rapidly, and is usually well tolerated, even in the elderly. This initial dose is followed by daily supplements of 100 to 200 mcg given IV. Normal T4 levels are achieved in 24 hours followed in 3 days by threefold elevation of T3. Oral therapy with thyroid hormone would be resumed as soon as the clinical situation has been stabilized and the patient is able to take oral medication. Administration of thyroid hormone indoses higher than those produced physiologically by the gland results in suppression of the production of endogenous hormone. This is the basis for the thyroid suppression test and is used as an aid in the diagnosis of patients with signs of mild hyperthyroidism in whom base line laboratory tests appear normal, or to demonstrate thyroid gland autonomy in patients with Grave’s ophthalmopathy. 131I uptake is determined before and after the administration of the exogenous hormone. A 50 percent or greater suppression of uptake indicates a normal thyroid-pituitary axis and thus rules out thyroid gland autonomy. For adults, the usual suppressive dose of levothyroxine (T4) is 1.56 mcg/kg of body weight per day given for 7 to 10 days. These doses usually yield normal serum T4 and T3 levels and lack of response to TSH. Thyroid hormones should be administered cautiously to patients in whom there is strong suspicion of thyroid gland autonomy, in view of the fact that the exogenous hormone effects will be additive to the endogenous source. In infants with congenital hypothyroidism, therapy with full doses should be instituted as soon as the diagnosis has been made. Note: (T3 liothyronine is approximately four times as potent as T4 levothyroxine on a microgram for microgram basis.) Store in a tight container protected from light and moisture. Store between 15°C and 30°C (59°F and 86°F). Starch is derived from corn & is gluten free.